I am back in New York for the rest of the month. My trip to Israel seems to have been a blessing on the world’s portfolio’s. I might just spend a month in Tel Aviv next November to help the Nasdaq get to 10,000. Earlier in the week Cisco hit 15 year highs. Thursday it was Walmart gapping up 10 percent to all-time highs. Friday..America’s biggest payroll and human resources company hit all-time highs. That is not bearish. Of course…Bitcoin did it as well. Meanwhile, the Economist can’t explain crypto so they are calling it a bubble. Again. Remember all those gold commercials on CNBC and Fox…..a lot of good they have done. The network is the new gold and that is why Bitcoin rocks and gold flops. 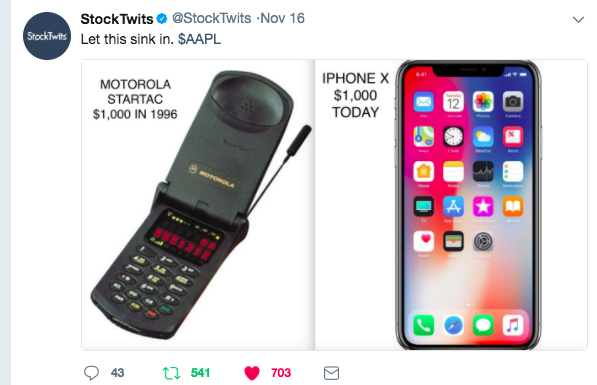 This one picture explains why we hit new highs in tech almost every day. Keep it simple while this bull rages on.